What makes a good wildlife garden? What do you consider to be a ‘wildlife garden’? Do you think it means weeds and untidiness? Or a great deal of hard work? In fact, a wildlife garden can be smart or scruffy. It can be easy to garden or high maintenance. It can be any kind of garden you like. With a few small changes, your garden could make a big difference to wildlife. Without really looking any different. 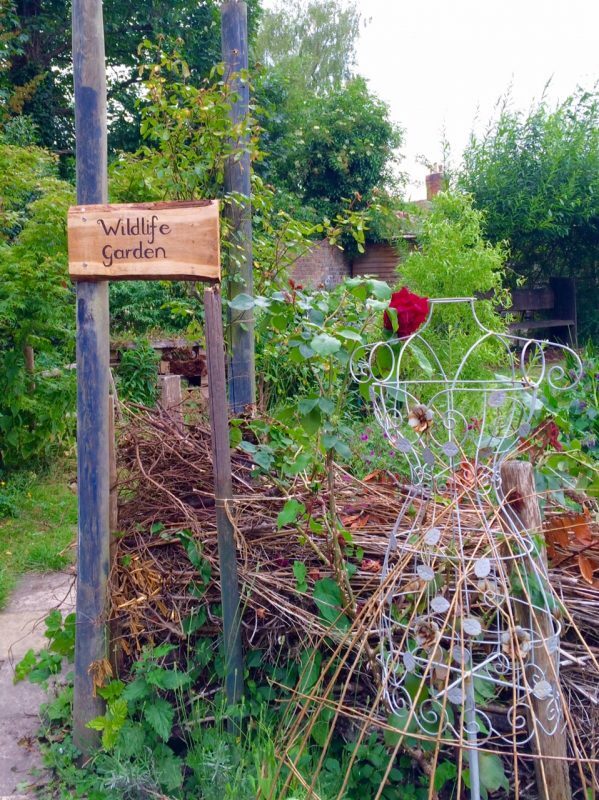 The Abbey Physic community garden in Faversham (open most days) has everything for wildlife, including dead hedges, a hugelkultur bed and more…but you can help wildlife with just a few tweaks. I went to a wildlife garden session with the Kent Wildlife Trust and Simon Pollard of Simple Life Ltd, a wildlife garden design and maintenance company. Four major issues: access, shelter, food and water. Firstly, access. This isn’t a problem for birds and pollinating insects because they can fly. But hedgehogs, toads and other small animals are really suffering from the way our gardens are becoming more closed off at ground level, due to modern fencing. The base of this fence is called a concrete ‘gravel board’. It makes it impossible for hedgehogs and toads to roam their territories. 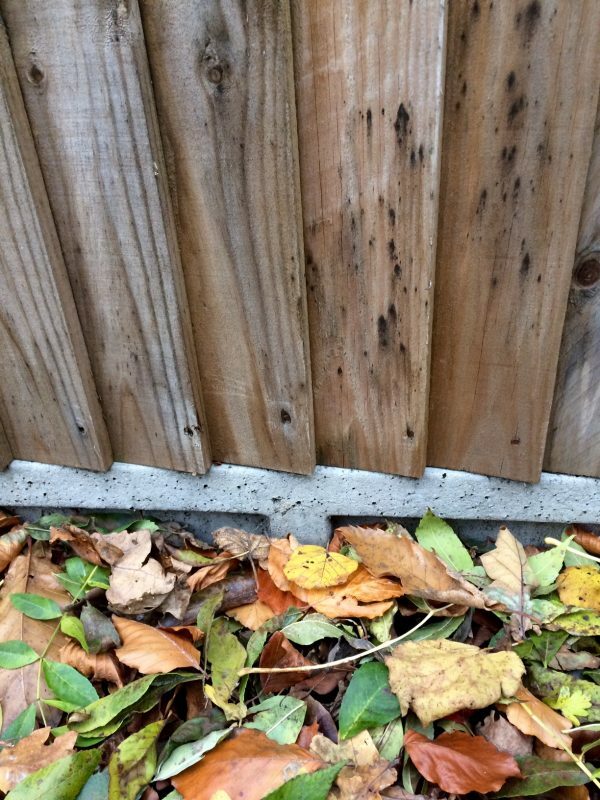 If you are putting in a new fence with a gravel board base, Simon suggests you cut a hole or holes for hedgehog/toad access – 13 x 13 cm or 5” squared will make all the difference. Access is also an issue when thinking about water. We recently made a mini wildlife pond out of an oak barrel. We ensured that there are lots of ways for frogs, toads and even hedgehogs to get in, and more importantly, out of the pond. Small creatures can drown unless there is some kind of step or gradient – even in the tiniest pond. Insulated roofs mean fewer places for bats to nest, but you can put up bat boxes to compensate. If you’re building a new extension, you can even find bricks built for bats or swallows. You can find out more about gardening for bats from the Bat Conservation Trust. Download their Bat Information Pack before buying or putting up a bat box. 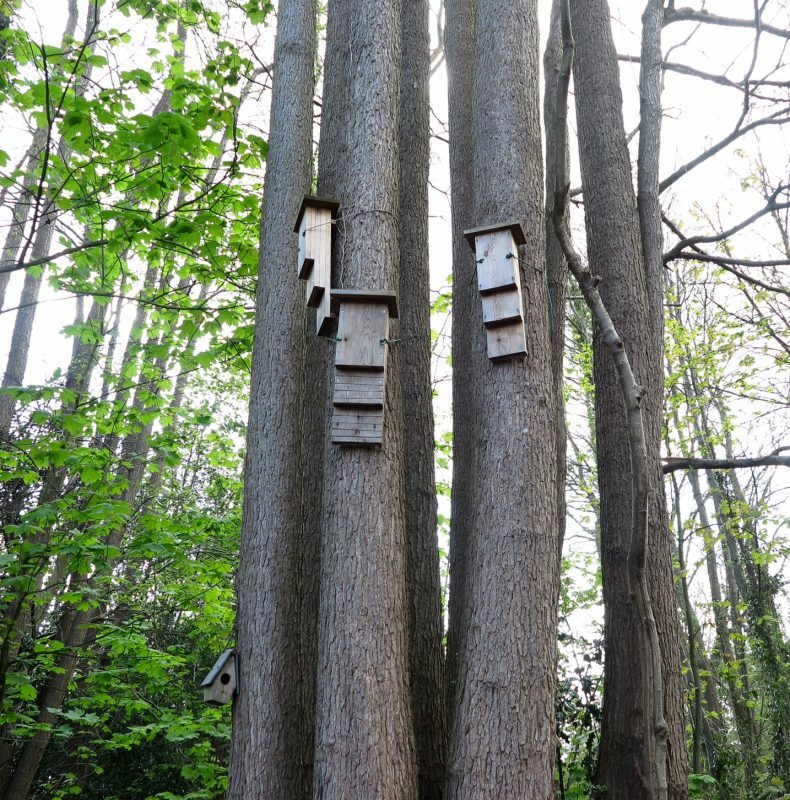 Fern Alder’s bat boxes are placed facing in three slightly different directions so that bats can choose which one is right in the weather. Amazon’s best-selling Wildlife World bat box also comes with full instructions on putting up bat boxes – for example, it’s a good idea to site three together with slightly different aspects. Wildlife World also do a best-selling hedgehog home, too, with the most 5* star reviews of any of the hedgehog houses. Bug hotels have become the new fashionable must-have for gardens, and they are very pretty. 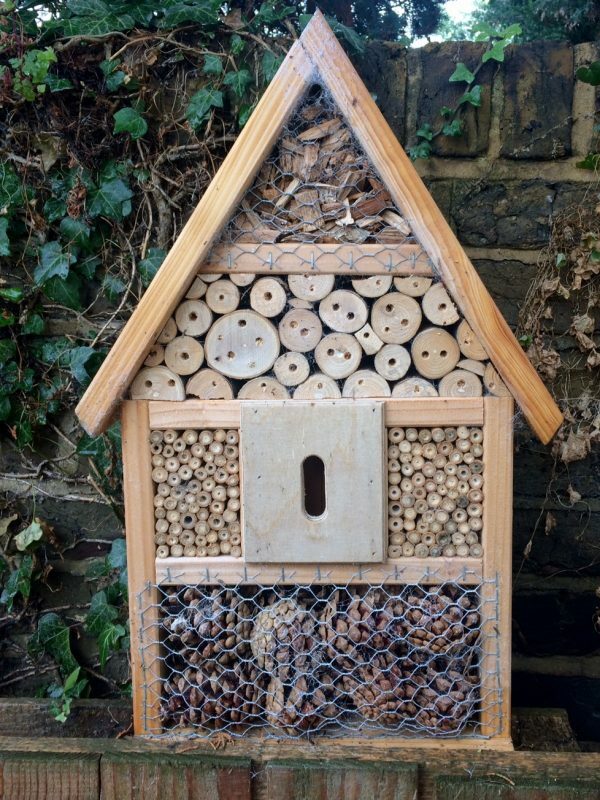 You can either get mixed bug hotels or specific ones for individual species, such as solitary bees or ladybirds. 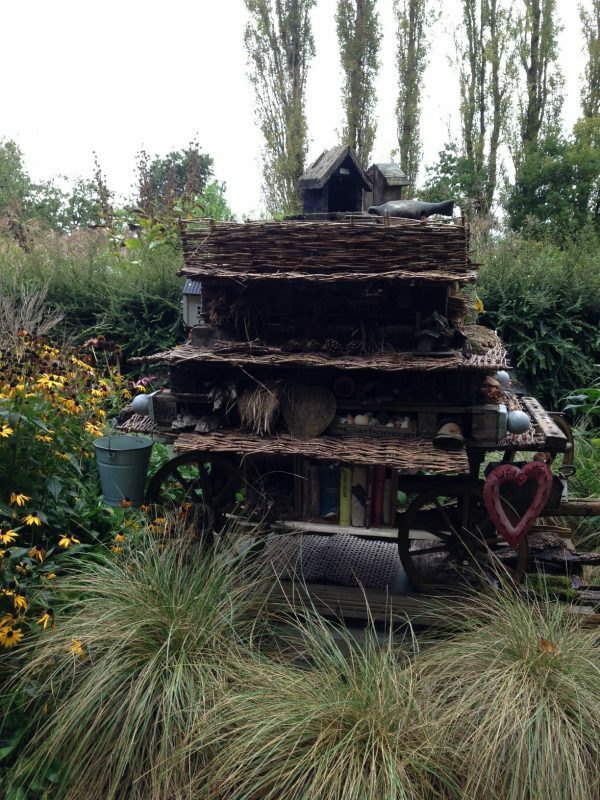 Sarah Langton-Lockton’s bug hotel. She put it up in September and it is being used – just a few months later. You can also just leave hollow stems, pine cones, leaves and twigs at the backs of borders, as a low-cost, low-effort ‘bug hotel’. I thought that if there were high winds then leaves stowed at the backs of borders might blow around the garden. However, Storm Angus didn’t dislodge any of the leaves at the backs of our borders, so don’t worry about that. A bug and bird ‘palace’ at Sussex Prairie Gardens, a very wildlife-friendly garden to visit. There are also good instructions here from the RSPB for building an insect hotel. 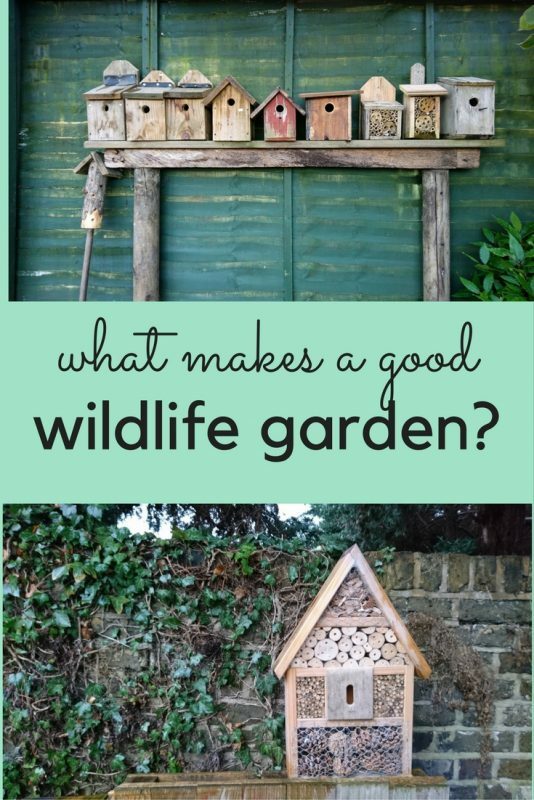 Or if you’d rather buy one, I’ve researched what’s available and the Natural Insect Hotel by Trixie is the bug hotel with the most 5* reviews on Amazon. £24.99 or Westwoods Insect/bee/bug shelter which is £16.99. There are also lots of bird box options, including the RSPB sparrow terrace nestbox (£23.99) long nesting box for 3 sparrow families. For individual nest boxes, the most popular was the (Chapel Wood Wild Bird Classic Nestbox – for one bird family, many species). £9.99. There’s more advice from the RSPB on choosing, siting or even making nestboxes here. And also in the book: BBC Gardeners World: 101 Ideas for a Wildlife Friendly Garden. 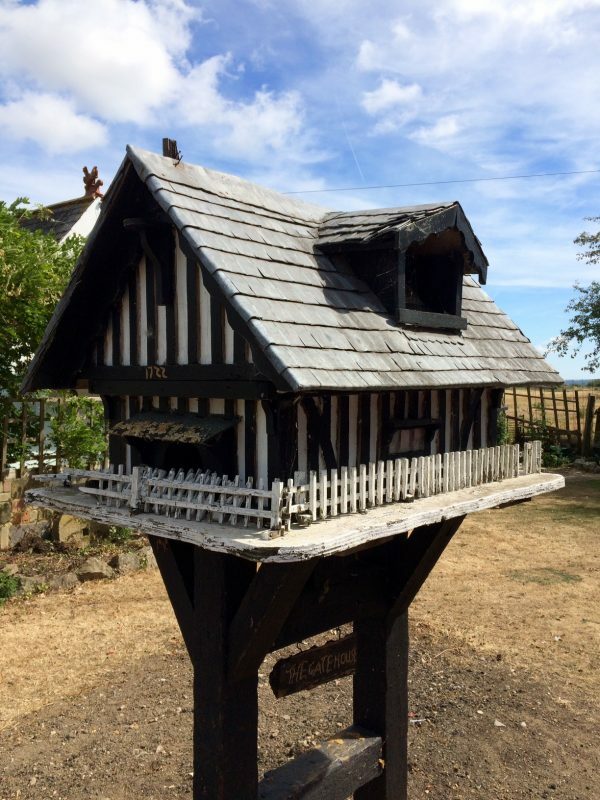 A manorial bird box and feeder, hand-made. Seen in Oare, Faversham. You don’t need anything this elaborate, but it is fun. Food in a wildlife garden starts with what you plant. In the excellent RHS Companion to Wildlife Gardening by Chris Baines, he says that layers of trees, hedges and shrubs provide wildlife with both food and shelter. Hedges are more wildlife-friendly than fences. Mixed hedges are more wildlife-friendly than single species hedges. Best4Hedging have an RSPB-approved hedging pack, for example, with 10 different species from hawthorn to guelder rose. Flowers and their seeds provide food for birds and insects. Try to have something in flower for as much of the year as possible. Choose flowers that have easy access to nectar, such as single-flowered flowers rather than double-flowered. Cleome, lavender and echinacea are all good wildlife-friendly flowers. Pollinating insects often like to feed on blocks of the same kind of flower, too, so try to plant several flowers not just single specimens. This ties in with general garden design advice to plant in drifts, blocks or group. 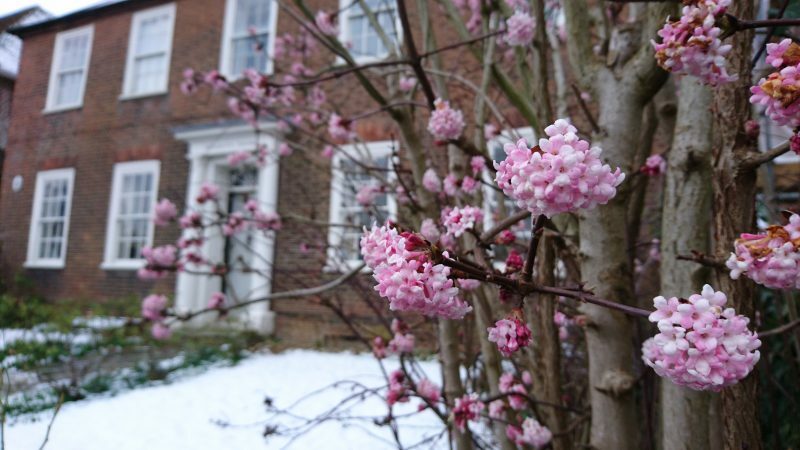 And here is viburnum in winter – you can have something in flower all year round. And then there’s your veg patch. I try to distract butterflies and caterpillars from the kale and chard by companion planting nasturtiums. It more or less works. And there’s netting, which is essential in high summer. But it’s nice to allow the birds and insects to share a bit of the bounty, and I don’t mind nibbled leaves. Finally there is the food you buy, which helps wildlife especially in winter. Each species (bird, hedgehog, etc) has different requirements and these get updated with every scientific advance. So white bread is out (for both birds and hedgehogs) and whole grains (birds) or meaty food (hedgehogs) is in. There are lots of options for bird food. We have discovered, through trial and error, that the better-quality bird foods are more popular with the birds and attract a wider range of species. We’ve particularly liked the Peckish range (and it’s got 382 mainly 5* reviews on Amazon). There are really two main things to know about water. One is that you must have water for wildlife. The other is that small creatures, babies and toddlers can drown in even very shallow water. Ponds, however tiny, must have stepped access in and out. And they must be guarded or positioned so that a small child cannot fall in. 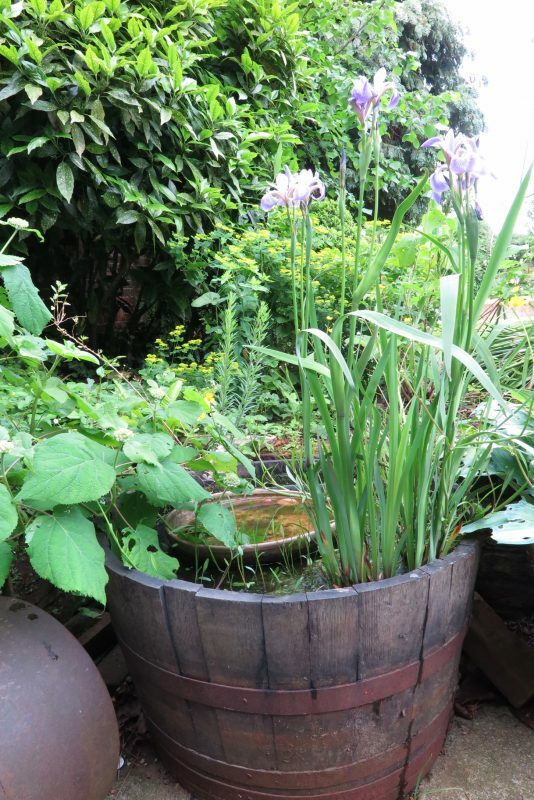 We made a mini wildlife pond out of an oak barrel and things that are easy to buy or adapt. Find out how here. Our oak barrel mini pond. Easy to make and it’s stayed pretty clean with oxygenating plants so we haven’t needed a pump. You can buy a bird bath made of resin or stone . Or you can do what we did, which was to use an upturned dustbin lid on top of an old chimney stack. There are more easy tips on helping wildlife in your garden here. And you can join your local wildlife trust if you live in Britain (there may be equivalents abroad). 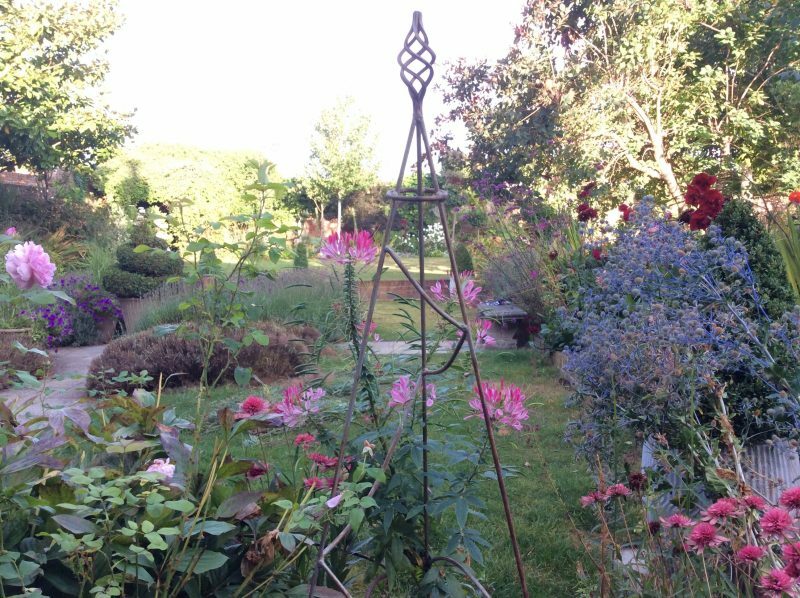 Some wildlife trusts, such as the Kent Wildlife Trust run an awards scheme so that gardeners with even the tiniest plot can achieve a ‘Gold’ wildlife gardening standard. So if you’re doing any building renovations or changes to the garden this year, ‘think wildlife’. We love seeing the birds outside our window and the beds humming with happy pollinating insects. Collectively, domestic gardens make up a huge amount of the green space in towns and cities. So what we do does make a difference. Do join us on the Middlesized Garden blog every Sunday morning by subscribing in the box on the top right. Or discover more tips and inspirational gardens on the Middlesized Garden YouTube channel. And please spread the wildlife-friendly word by sharing this post using the buttons below. Thank you! 3 comments on "What makes a good wildlife garden?" The birds in my garden absolutely love sunflower hearts, but then again so do the pesky squirrels! Thanks for sharing this article. I am looking into my 2017 project for the spring and summer and I think I am going to go ahead with a wildlife garden. I have my new driveway and new patio, I have done my veggie patchand obviously that requires some time, but I think I might put the rest of my time into a wildlife area at the bottom of the garden. I have always been fascinated by wildlife and how they live so what better then to own a home for them!